Is there anything more joyous than throwing colorful confetti around to mark a special occasion? 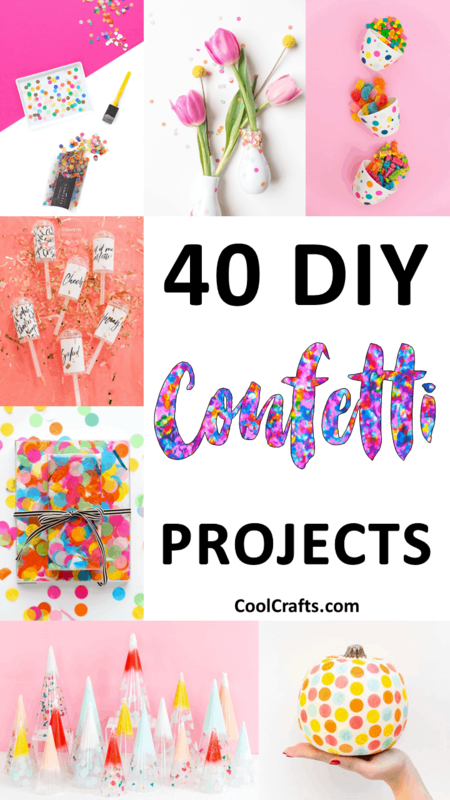 We think the only thing that could beat this is to actually make awesome things using confetti, and after looking at the following 40 DIY projects, we have a feeling you’ll agree! From confetti-clad furniture and home decor, to DIY confetti poppers, stationary, and cake toppers (just to name a few! ), the following 40 DIY tutorials are both fun and easy to follow. A Joyful Riot has created these DIY confetti blowers for special occasions like New Year’s Eve, bridal showers, and even weddings! They’re fun to make, plus fun to use too. 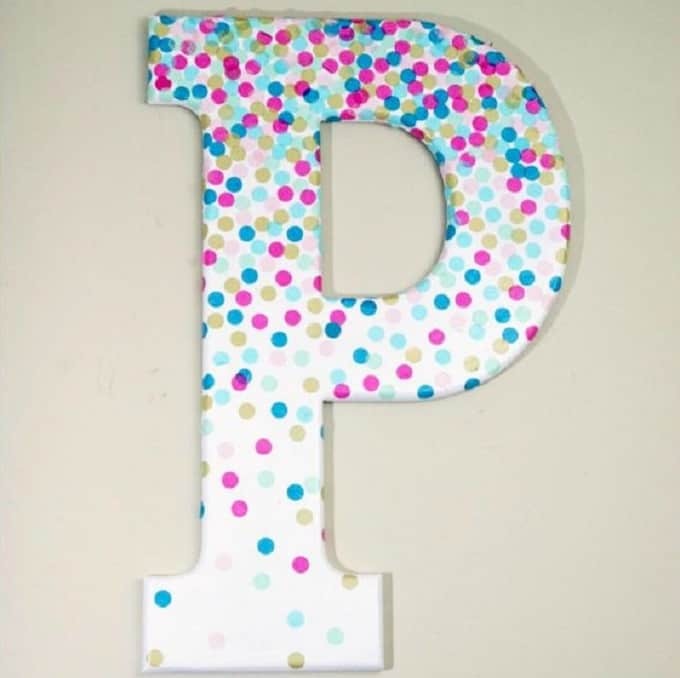 Here’s one way to add glitz and color to your space! All She Wrote Notes will show you how to make your very own DIY confetti chair. These DIY confetti eggs from And We Play are loads of fun! Children will love receiving these as Easter surprises, or why not get them involved in the making process too? If you want a cake topper that will turn any cake into a masterpiece, then this DIY confetti version from Aunt Peaches will do the trick! You can follow this tutorial to make any number, letter, or shape that you want. Wow, this DIY confetti tray from Brit + Co is the perfect item for storing jewelry, keys, and other bits and bobs. You can also use it as a pretty serving tray! Burlap and Blue has created her very own confetti soap – isn’t that wonderful? These would make great DIY presents. These DIY easy shaker cards from Damask Love contain loads of colorful confetti for that extra special touch. Your friends and family will love receiving these! Here’s a fun DIY confetti tutorial for your children! DIY Candy will teach them how to make their own cool bookmarks. Here’s how you can make some eye-catching and show-stopping confetti balloons for your next big party, courtesy of DIY Network! You can leave them as is or even burst the balloons to produce a shower of confetti. Here’s a great piece of advice: you should throw happiness around like confetti! Dream a Little Bigger has embraced these wonderful words of wisdom and created her very own DIY confetti wall art. You can even create your own bags of confetti, just as Evermine has done. Then you can distribute your DIY confetti amongst your friends and family at your next big party! Fancy creating your own confetti tote? The clever folk over at Kin Community (via their Facebook page) will show you how! This DIY gold confetti mug looks like it came from a high-end home store! Lines Across will teach you how you can recreate this look by following her tutorial. You can even decorate your plain cake stand using confetti in your most favorite shades. Made to be a Momma has used pretty pink confetti for her DIY tutorial. Who wouldn’t feel inspired to write or sketch with these DIY confetti pencils from Make and Tell? We’re so surprised by how easy these are to create too. Minted has created her very own confetti wrapping paper to add fun and color to any gift she wraps! You could even use your new confetti wrapping paper to make cards and decorate notebooks. Mod Podge Rocks Blog has created these DIY confetti coasters to quickly and easily jazz-up any table! These would make a great house-warming gift too. Love DIY monograms? Mod Podge Rocks Blog has created a tutorial to show you how to make these confetti versions of the trend. These DIY confetti crackers are perfect for Valentine’s Day, but we think you could also make them as an alternative to store-bought Christmas crackers! Oh Happy Day will show you how. You can easily add color and confetti to an otherwise plain trinket dish by gluing on some confetti, just as Oh Joy has done! Mix and match with your favorite colors or types of confetti. Here’s an Easter alternative to traditional eggs! Oh Joy prefers her decorative eggs with colorful and vibrant confetti on them. Omiyage Blogs has created this fun plastic bow that contains confetti – how unique is that? It’s got a cute Japanese aesthetic that we love. This DIY confetti pencil case is perfect for storing more than just pencils – think all of your office stationary needs, or even makeup, jewelry, nail polish etc. Studio DIY is the talented blogger behind this tutorial. Here’s a great idea from Studio DIY teaching you how to create your own portable confetti photo backdrop! It looks great in photos, doesn’t it? 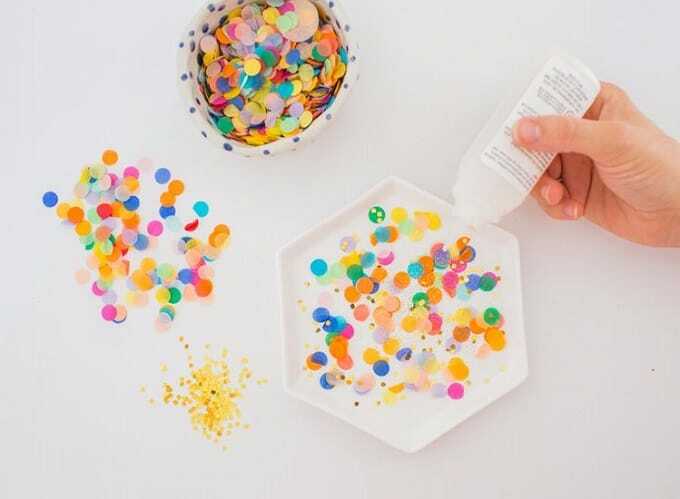 Here’s another great DIY confetti popper tutorial, this time from Style Me Pretty. These are fun additions to any party! Sugar and Cloth has made these DIY confetti Christmas cones and they serve as the most unique and colorful Christmas tree table settings! Create more than one and give them as gifts to loved ones. These DIY confetti vases are perfect for any occasion! You can create your own by following this tutorial from Sugar and Cloth. Here’s a great idea to celebrate Spring Break, or even just a beautiful summer day. Tell, Love and Party has made these confetti covered drink umbrellas and we think they’re fantastic! Tell, Love and Party has also made these DIY confetti candy bowls and filled them with sweet treats. These would serve as wonderful party favors. You can even make your own confetti decorative tape – simply follow this tutorial from That’s What Che Said to learn more. What will you use your quirky and colorful new tape for? This unique craft project tutorial from The Charm It Spot will show you how to make a paper mâché bowl using confetti. It’s a fun and inexpensive project that you’re to love! We’re in love with this DIY confetti-dipped table tutorial from The Confetti Bar and think it’s the perfect way to add quirkiness to any space. Check out the full tutorial from The Confetti Bar to see more! You can even make DIY confetti garlands, just as The Confetti Bar has done! Where will you hang yours? How stunning are these DIY confetti bowls? They’d make a great showpiece on any table, so be sure to check out the full tutorial from The Confetti Bar! The Crafted Life has created a confetti-adorned pumpkin and it’s the perfect craft project to celebrate fall and Thanksgiving. Is there anything you can’t do with confetti?! For those wishing to add confetti-inspired artwork to their phone cases, now you can! The Lil’ Things Blog is here to show you how. These DIY confetti poppers will blow your mind! The Sarah Johnson has created them in a variety of pretty patterns and colors so there’ll definitely be one to suit everyone’s personal taste. Is there a special occasion that calls for an incredibly unique gift? This Heart of Mine has actually created a confetti-dipped champagne bottle to take gift giving to a whole new level. Your plants shouldn’t have to miss out on the confetti trend either! Thankfully, Uncommon Designs Online has created a tutorial to help you recreate this confetti-clad plant pot. These easy party decorations from The Confetti Bar via Best Friends for Frosting will keep the fun going well into the early hours of the morning. You can hand out these DIY confetti sticks to guests and let them throw their confetti in the air like they just don’t care! There you have it – 40 amazing DIY projects that you can make using confetti! Which DIY tutorials were your favorites? We’d love to hear from you in the comments section below! Thank you so much for including Mod Podge Rocks AND DIY Candy. I LOVE confetti – can’t wait to share this!